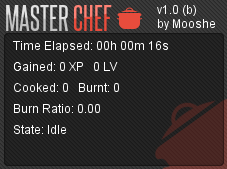 Master Chef is an AIO cooking script for RS3. It supports portable ranges, static ranges, and log fires (including eternal fires such as al-kharid and rogue's den). It allows you to chain multiple profiles together which can be configured to finish after a certain goal has been reached (Experience, Level, or Time goal). New Chain - It will create a new chain at the end of the order. The order goes from left to right. Chain Selection - Your chains are tabbed, and are in sequential order. They will be executed and saved like this. Bank/Media Tiles - These positions represent where the bot will bank, and where the bot will cook. If you are using logs or portable range, make sure to be in a 3x3 area which can have a fire or portable range placed on it. Goal Value - Represents a value for when the chain will finish, and move onto the next. Time - A value which represents the amount of time the chain will live before moving on. You may use days/hours/minutes to format the time (For example: 4d 12h 32m 16s). Any raw numbers will be interpreted as seconds, and are saved as such. Experience - This represents an amount of experience to be gained before a chain is finished. For example, if I want to gain 10,000 exp, I will put "10000", and the chain will end after this goal has been reached. Level - This represents the amount of levels to be gained before a chain is finished. For example, if I want to gain 14 levels, I would put "14", and it will move onto the next chain after 14 levels have been gained. Static Range - Represents any range, typically located within houses or structures. The bot will try to open any obstructed path, however, due to the nature of the dynamic locations, this may not always work. If you come across an area which doesn't work with this, please report it. Portable Range - Uses portable ranges. If a portable range cannot be found within the media area, it will place one down. Make sure you set the media area to a 3x3 area which can accept portable ranges. Log Fire - Uses fires to cook. If a fire cannot be found within the media area, it will try to use logs in the inventory to make a fire. If there are no logs in your inventory, it will try to find logs in your bank. Start with protean logs in your inventory for best experience. 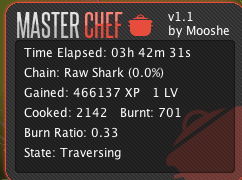 Allows user to define item name to cook, where to cook, and where to bank. 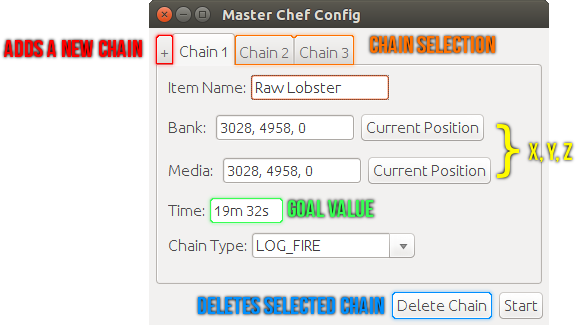 Allows user to define a Time/Experience/Level goal, in which the chain will be removed from the queue. If a portable range cannot be found around you, it will place one down in the designated media area. If a fire cannot be found within the designated media area, it will require either logs in your inventory, or in your bank. Protean logs work best for this. I will add any progress screenshots if you'd like me to. Thanks for writing this script for us. There are some issues with the SDN's git repository. It isn't up yet, but should be up soon once it has been fixed. Any news on this script, can't wait to give it a go! If it doesn't show up for you, you will need to clear your cache. If you're on firefox, you can do so by pressing Ctrl + Shift + Delete. If you experience any issues or bugs, please report them here and I will handle them promptly. Doesn't seem to work. Opens bank and closes it shortly after without taking anything out. Please post the configuration screenshot. 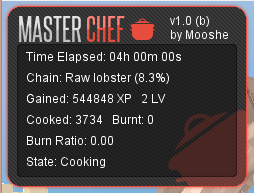 Where it says "Item Name", make sure it's the raw item (such as "Raw Lobster", or "Raw Tuna"). 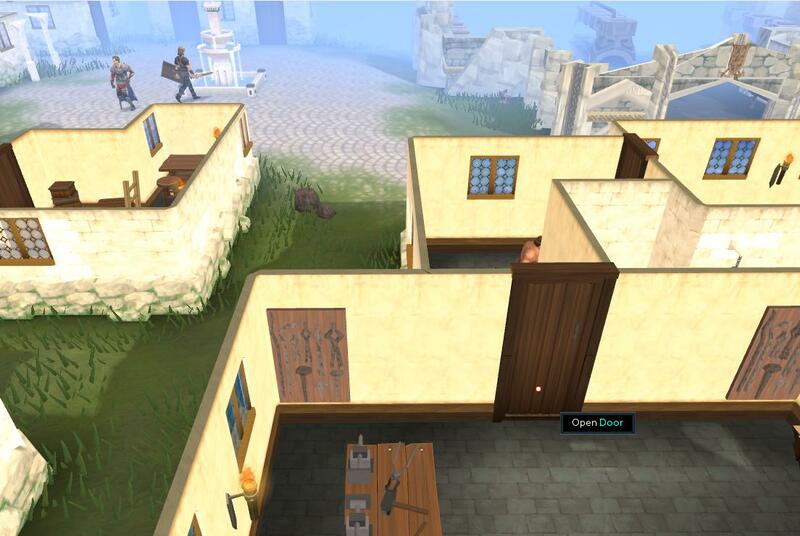 Portable Range chains require you to have a portable range in your bank if there are none within the area. 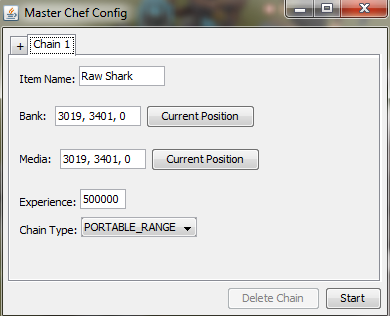 If you don't have any portable ranges and it can't find any portable ranges, it tries to move onto the next chain. If there isn't a next chain, it will go into idle and pause the script. However, on an unrelated note, I currently checked the experience goal, and it appears to not end (it will continue on despite the experience being reached). I'll fix this in a couple of minutes. Great job! Trying it out now, seems to be working fine so far! The script doesn't use ranges already set down and instead goes for a new portable every inventory. If you have none in your bank then the script just sits idle despite there being a portable range already nearby. It currently relies on portable ranges within the area of the bank because if the media tile is in a different region, it cannot see if there are any portable ranges near there. I'll probably change this in the future, though. Just by having ranges in your bank (at least one) should fix this, and it won't place it down unless it cannot find any nearby ranges from the media tile. ​Doesn't seem to work at Alkharid range. Just clicks on the NPC in there and can't find the range. Have tried all spots around the range as the media spot. I found the issue. It was with how the range was being selected. I fixed this, and should be updated within 10-20 minutes. BTW, I was testing on the Al-kharid range, and it's a bit narrow, and will sometimes walk outside of the building. I recommend a different location, such as east falador. it's trying to open the doors because the range is unreachable (the door may be shut or outside of the loaded region).